Even some of America’s brightest minds – like former Federal Reserve Chairman Alan Greenspan – jumped on the stable housing bandwagon. It was unthinkable that the housing market could crash. Then, the subprime mortgage crisis hit. When people or companies load up on too much debt – especially low-quality debt – it can lead to a crisis. When I say low-quality debt, I mean riskier loans that have a higher possibility of not being paid back. That’s exactly what happened during the subprime mortgage crisis. “Subprime” was just a gentler way of saying riskier debt. The US financial crisis that started in 2007 was triggered by the bursting of the US housing bubble. However, this bubble formed because of weak lending standards and cheap, low-interest loans. This let too many people borrow too much money to buy homes they really could not afford. This tidal wave of low-quality debt would eventually crash the housing market and threaten the survival of the banking system. What had been unthinkable a few years earlier had become a stark reality. 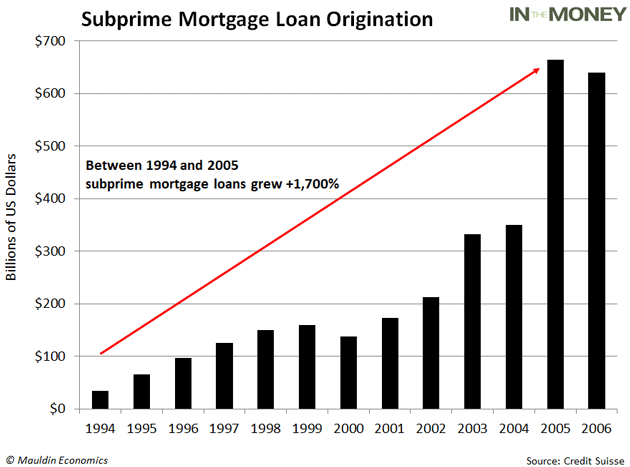 From 2004 to 2006, subprime mortgages grew from 8% – near the long-term average – to 20% of the total mortgage market. Then the housing bubble burst in 2007. From January 2007 to March 2009, the average home price fell 20%. The US sank into its deepest recession since the Great Depression. And it all came back to one thing: too much low-quality debt. This same explosion in low-quality debt is happening in another corner of the US debt market. I’m talking about BBB-rated corporate bonds. And just like the housing market, people think this market can never go bust. Since the end of the financial crisis, the triple-B corporate bond market has grown to twice the size of the subprime mortgage market. This market is an accident waiting to happen. Corporate bonds are debt issued by companies. It’s a way for companies to raise money, and the money must be paid back. Almost every company in the world uses the corporate bond market. But just like the subprime mortgage market, it’s the poor quality of the debt that’s the problem. Corporate bonds are rated by credit agencies like Moody’s, S&P, and Fitch. A bond is considered investment-grade if it’s rated between AAA and BBB-. The closer to triple-A, the safer the bond. (See credit ratings explained here). But according to Morgan Stanley, the US has been flooded with BBB-rated bonds. That is the lowest a bond can be rated and still be considered investment grade. In just the last 10 years, the triple-B bond market has exploded from $686 billion to $2.5 trillion – an all-time high. To put that in perspective, 50% of the investment-grade bond market now sits on the lowest rung of the quality ladder. Ultra-low interest rates have seduced companies to pile into the bond market. But as I’ve covered here in The Weekly Profit, interest rates have risen significantly. Since July 2016, the interest rate on the 10-year Treasury note has doubled. And the value of corporate bonds is tied to government bonds. When rates on government bonds rise, it makes investment-grade corporate bonds less attractive. This is especially true for bonds on the lower tiers such as BBB-rated bonds. That’s how the bond market works. Bonds sold today with a higher interest rate make yesterday’s lower-rate bonds lose value. So, higher-rated bonds are a better deal for investors. And that’s bad news for the companies issuing lower-rated bonds. 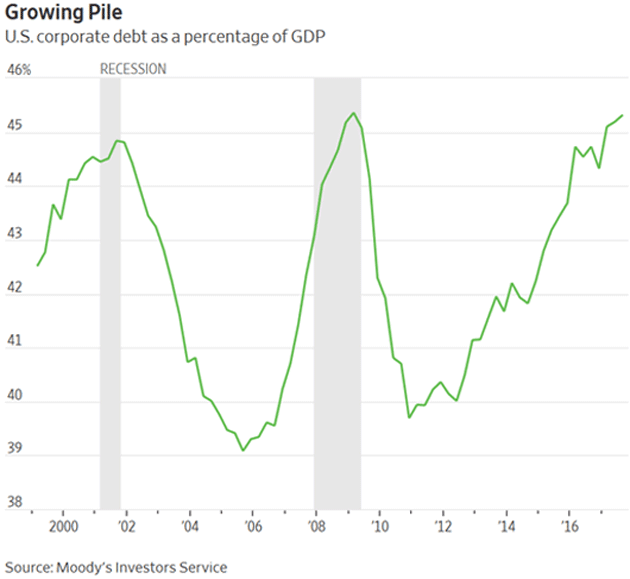 According to Moody’s, 10% of BBB-rated corporate bonds become what’s known in the industry as “fallen angels” in a recession. That’s a tactful way of saying they’ve been downgraded to “junk” status. 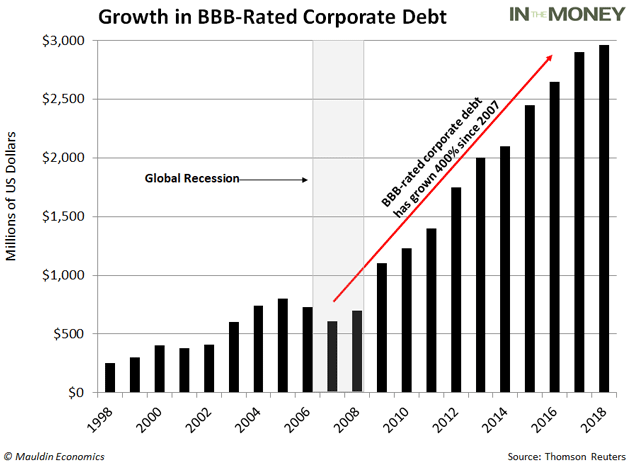 The explosion in the number of BBB-rated bonds guarantees that we will see more fallen angels than ever before during the next recession. And when that happens, investors that own BBB-rated bonds are going to get badly hurt. I’m not the only one saying this. I have some pretty good company. She also thinks high corporate debt could prolong a downturn in the economy and lead to lots of bankruptcies. This market is a ticking time bomb. *Robert Ross is senior equity analyst at Mauldin Economics. This article is from a regular Mauldin Economics series called The Weekly Profit. It first appeared here and is used by interest.co.nz with permission.